iMovie ’11 offers many options for styling title text—more than you probably realized. But what if you want even more control over how text appears? Or maybe you want a custom graphic or logo to appear in the corner of your video. With an image editor and a small amount of trickery, you can easily do so. 1. Create a new file (File > New) set to the dimensions of your video. If you captured 720p footage, for example, the resolution would be a width of 1280 and height of 720; if you shot 1080p, the resolution would be 1920 by 1080. (Adobe’s applications offer several video presets, which also add guides to alert you to areas where the image may be cropped in some players.) If you’re given the option to specify a background color, choose Transparent. 2. Create your titles and content where you want them to appear on the screen. If you didn’t specify a transparent background earlier, delete or hide the background. Adobe Photoshop Elements provides guides to help prevent your content from getting cropped. 3. Choose (File > Save As) to save the file. From the Format pop-up menu, choose PNG. If asked whether to apply interlacing, choose None. iMovie’s Cutaway feature is designed to insert footage without disrupting existing video, such as when you want to jump to another clip while someone talks over it. We can take advantage of the feature by inserting our transparent PNG image instead of a clip. 1. Locate the photo in the Finder, and position the Finder window so you can also see your iMovie project. 2. Drag the image file onto the top of your project’s filmstrip where you want it to appear. 3. From the pop-up menu that appears, choose Cutaway. The image is added as a cutaway clip that sits above the filmstrip. ...and then set it as a Cutaway. 4. Since you’ve added a picture to your project, iMovie applies the Ken Burns Effect to it. 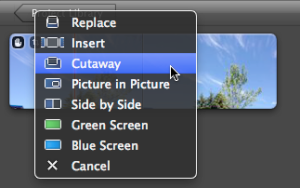 Select the cutaway clip and click the Crop button in iMovie’s toolbar, or double-click the Crop icon in the clip. In the Viewer, click the Fit button to make the image occupy the entire frame. 5. If you need to, adjust the duration and placement of the cutaway clip by dragging its edges in the Project browser. 6. Since the image just appears spontaneously during playback, you may want to add a transition. Double-click the cutaway clip to bring up the Clip Inspector and adjust the Cutaway Fade Manual slider. 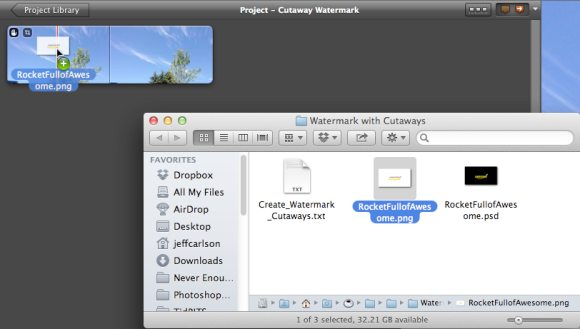 You can also change the image’s opacity, a helpful tool for making watermarks that are unobtrusive. When you play the video, the image appears as a snazzy new title or watermark. You can use the image file in any project you wish using these steps. The finished title as a cutaway.